This study investigates whether protein kinase G (PKG), protein kinase A (PKA) and protein kinase C (PKC) are involved in the regulatory mechanisms of store-operated channel (SOC) in pulmonary arteries. Pulmonary artery smooth muscle cells (PASMCs) were enzymatically dissociated from rat intralobar pulmonary arteries. Whole cell, cell-attached and inside-out patch-clamp electrophysiology were used to monitor SOCs in isolated PASMCs. Initially the Ca2+-ATPase inhibitor cyclopiazonic acid (CPA, 10 μM) initiated a whole cell current that was reduced by the SOC blocker SKF-96365 (10 μM). Subsequent work using both cell-attached and whole cell configurations revealed that the PKG and PKA inhibitors, KT5823 (3 μM) and H-89 (10 μM), also stimulated SOC activity; this augmentation was attenuated by the SOC blockers SKF-96365 (10 μM) and Ni2+ (0.1 mM). Finally using the inside-out configuration, the PKC activator phorbol 12-myristate 13-acetate (PMA, 10 μM) was confirmed to modestly stimulate SOC activity although this augmentation appeared to be more substantial following the application of 10 μM inositol 1,4,5-triphosphate (Ins(1,4,5)P3). SOC activity in PASMCs was stimulated by the inhibition of PKG and PKA and the activation of PKC. Our findings suggest that the SOC could be a substrate of these protein kinases, which therefore would regulate the intracellular concentration of calcium and pulmonary arteriopathy via SOC. Intracellular calcium ([Ca2+]i) is an important second messenger responsible for many physiological functions including contraction, cell growth and gene expression. Many agonists increase [Ca2+]i by mobilizing intracellular Ca2+ stores, such as the sarcoplasmic (SR) or endoplasmic (ER) reticulum. To maintain Ca2+ signaling, these intracellular Ca2+ stores must be refilled and as such many agonists are thought to activate specialized plasma membrane channels termed store-operated channels (SOCs) . By definition, SOCs are Ca2+-permeable cation channels which are activated by depletion of intracellular Ca2+ stores . The activation of SOCs is often termed 'capacitative Ca2+ entry (CCE)', as the principal function of these Ca2+ channels is to refill the internal stores, as if they were in essence capacitors . Inhibitors of the sarco-endoplasmic reticulum Ca2+-ATPase pump (SERCA) are the most common tools used to deplete the intracellular Ca2+ stores and consequently activate these unique channels. It is generally accepted that SOCs play an important role in regulating smooth muscle contraction and cellular proliferation in the resistance vasculature [4, 5]. In a similar, although less documented manner, SOCs have also been coupled to the genesis of pulmonary vascular tone and pulmonary artery smooth muscle cell (PASMC) proliferation . Given their functional importance and their role in severe pulmonary arteriopathies, there is considerable interest in defining how SOCs are regulated in PASMCs . To date, literature specific to PASMCs has prominently stressed a role for IP3, PIP2 and other lipid products in the activation of these channels. While important, few pulmonary studies have ventured beyond these confines to electrically address other aspects of SOC regulation, including the role of protein kinase G (PKG), protein kinase A (PKA) and protein C (PKC). This is surprising given the rich nature of the research performed on smooth muscle cells derived from resistance arteries isolated from the coronary, mesenteric and hepatic circulation [4, 8, 9]. The main objectives of this study were to isolate and characterize a SOC current in pulmonary artery myocytes and determine whether protein kinases (i.e. PKG, PKA and PKC) are involved in the activation of SOCs in PASMCs. Whole cell, cell-attached and inside out patch-clamp electrophysiology were used to monitor SOCs and the effects of various agents known to modulate protein kinases were recorded. Like smooth muscle cells isolated from the coronary, mesenteric and hepatic circulation, SOCs in PASMCs were stimulated by PKG and PKA inhibition and PKC activation. The functional significance of these findings is discussed. All procedures and protocols were approved by the Animal Care and Use Committee at Kaohsiung Medical University. Briefly, female Sprague-Dawley rats (250-350 g) were sacrificed with an overdose of urethane (1.25 g/kg) via intraperitoneal injection. Lungs were carefully removed and placed in cold phosphate-buffered saline containing (in mM): 122 NaCl, 1 MgCl2, 0.5 KH2PO4, 10 HEPES, 5 KCl, 0.5 NaH2PO4, 11 Glucose, 0.1 EGTA, 0.1 CaCl2, with pH adjusted to 7.4 with NaOH. Intralobar resistance pulmonary arteries (internal diameter 300-400 μm) were dissected free of the surrounding tissue and cut into 1 mm segments. Pulmonary artery smooth muscle cells (PASMCs) from rat intralobar pulmonary arteries were enzymatically isolated as follows. Arterial segments were placed in a warm (37°C) cell isolation medium containing (in mM) 122 NaCl, 1 MgCl2, 0.5 KH2PO4, 10 HEPES, 5 KCl, 0.5 NaH2PO4, 11 Glucose, 0.1 EGTA (pH 7.4, NaOH) for 20 min. After this equilibration step, arterial segments were initially incubated (37°C) in 1 mg ml-1 papain and 0.85 mg ml-1 dithioerythritol for 20-25 min. After enzyme treatment, the tissue was washed three times in ice-cold isolation medium and triturated with a fire-polished pipette to release the myocytes. Cells were stored in ice-cold isolation medium for use on the same day. SOC currents in PASMCs were recorded in voltage-clamp mode using whole cell, cell-attached and inside-out configurations . When employing whole cell patch-clamp electrophysiology, PASMCs were placed in a recording dish and perfused with a bath solution containing (in mM): 120 sodium methanesulfonate, 20 Ca(OH)2, 0.5 3,4-diaminopyridine, 10 HEPES and 10 glucose (pH 7.4, HCl). A recording electrode pulled from borosilicate glass (resistance, 4-7 MΩ for whole cell recordings; 8-12 MΩ for cell-attached and inside-out patches) was coated with sticky wax to reduce capacitance [11, 12] and backfilled with pipette solution containing (in mM): 138 CsOH, 2.5 EGTA, 1 Ca(OH)2 (free internal [Ca2+] ~100 nM as calculated using EQCAL software), 10 HEPES and 2 Na2ATP (pH 7.2, HCl). This pipette was gently lowered onto a PASMC, negative pressure was briefly applied to rupture the membrane and a gigaohm seal was obtained. Cells were voltage clamped at 0 mV while resting membrane currents were recorded on an Axopatch 700A amplifier (Axon Instruments, Union City, CA, USA). Cells were subsequently equilibrated for 25 min and then exposed to a series of voltage ramps (-100 mV to +100 mV, 0.2 Vs-1) or step protocols (20 mV increments from -80 to +20 mV for 200 ms). These voltage protocols were performed under resting conditions and in the presence of cyclopiazonic acid (CPA, 10 μM) ± 1-[β-(3-(4-Methoxyphenyl)propoxy)-4-methoxyphenethyl]-1H-imidazole HCl (SKF-96365, 10 μM) [13, 14], (9S,10R,12R)-2,3,9,10,11,12-hexahydro-10-methoxy-2,9-dimethyl-1-oxo-9,12-epoxy-1H-diindolo-[1,2,3-fg:30,20,10-kl]pyrrolo[3,4-i][1, 6]benzodiazocine-10-carboxylic acid methylester (KT5823, 3 μM) or N-[2-((p-Bromocinnamyl)amino)ethyl]-5-isoquinolinesulfonamide (H-89, 10 μM). Whole cell currents were then filtered at 1 kHz (low-pass Bessel filter), digitized at 5 kHz and stored on a computer for subsequent analysis with Clampfit 9.0. A 1 M NaCl-agar salt bridge between the bath and the Ag-AgCl reference electrode was used to minimize offset potentials [12, 15]. All electrical recordings were performed at room temperature. When using the inside-out and the cell-attached patch clamp configurations to monitor single channel activity, recording pipettes were backfilled with a solution containing (in mM): 126 CsCl, 10 HEPES, 11 Glucose, 1.5 CaCl2, 10 TEA, 5 4-AP, 0.0002 Iberiotoxin, 0.1 DIDS, 0.1 Niflumic acid and 0.005 Nifedipine (pH 7.2, NaOH). The bath solution for the inside-out configuration contained (in mM): 18 CsCl, 108 C2H3CsO2, 1.2 MgCl2, 10 HEPES, 11 Glucose, 1 BAPTA, 0.48 CaCl2, 1 Na2ATP and 0.2 NaGTP (pH 7.2, Tris). The bath solution for the cell-attached configuration contained (in mM): 126 KCl, 1.5 CaCl2, 10 HEPES, 11 Glucose and 0.01 Nifedipine (pH 7.2, Tris). Following a 25 min equilibration period, single channel activity in excised patches was recorded at -80 mV, filtered at 100 Hz and digitized at 50 kHz. These recordings were collected under resting conditions and in the presence of phorbol 12-myristate 13-acetate (PMA, 10 μM), inositol-1,4,5-triphosphate (Ins(1,4,5)P3, 10 μM), KT5823 (3 μM) and H-89 (10 μM). Whole cell SOC currents were analyzed from the baseline-to-peak amplitude within 50 ms. Single SOC current amplitudes were calculated from idealized traces of at least 60 s in duration using the 50% threshold method and analyzed using Clampfit 9.0 as previously described . For single channel analysis, SOC activity (NPo) was determined from continuous gap-free data using Clampfit 9.0. The NPo was calculated from the following equation: NPo = (Σt i i)/T, where i is the number of channels open, t i is the open time for each level i and T is the total time of analysis. Data are expressed as means ± SE, n indicating the number of cells. Repeated measures analysis of variance (ANOVA) compared values at a given voltage. When appropriate, a Tukey-Kramer pairwise comparison was used for post hoc analysis. ANOVA followed by Dunnett's test was performed to statistically compare the open probability of SOCs. P ≤ 0.05 was considered statistically significant. Buffer reagents, papain, dithioerythritol, H-89, KT5823, PMA, CPA, Ins(1,4,5)P3, NiCl2 and SKF-96365 were obtained from Sigma-Aldrich Chemical Co. (St Louis, MO, USA). All drugs and reagents were dissolved in distilled water unless otherwise noted. CPA, PMA and KT5823 were dissolved in dimethylsulphoxide at 10 mM. Serial dilutions were made in phosphate-buffered solution to a final solvent concentration of ≤0.01%. Our investigation of SOCs in PASMCs first began by monitoring the whole cell currents evoked by CPA. This assessment involved the application of voltage ramps (-100 mV to +100 mV, 0.2 Vs-1) every 30 s from a holding potential of 0 mV in order to inactivate voltage-dependent Na+ and Ca2+ channels. The recording solutions dictate that inward currents at negative potentials should be the result of Ca2+ and Na+ influx, while outward current at positive potentials should be putatively generated by Cs+ efflux . Figure 1 illustrates that bath application of 10 μM CPA induces a whole cell SOC current that displays modest outward rectification and which reverses at -2 ± 1 mV (n = 6). In the presence of CPA, current density at -100 mV and +100 mV peaked at -7.3 ± 1.1 pA pF-1 and 13.9 ± 1.1 pA pF-1 (n = 6), respectively. These values were significantly greater (P < 0.01) than control (-1.6 ± 0.1 pA pF-1 and 3.5 ± 0.3 pA pF-1 at -100 mV and +100 mV, respectively). CPA evoked whole cell currents were subsequently attenuated by the addition of SKF-96365 (10 μM, a SOC inhibitor) to the perfusate. In the presence of CPA and SKF-96365, current density at -100 mV and +100 mV was 4.6 ± 0.8 pA pF-1 and 6.5 ± 1.1 pA pF-1, respectively. Cyclopiazonic acid (CPA) evokes an SOC conductance. Using whole cell patch clamp electrophysiology, PASMCs were voltage clamped and then periodically exposed to voltage ramps (-100 mV to +100 mV) in the absence and presence of 10 μM CPA ± 10 μM SKF-96365 (SKF). A, original traces showing that CPA activates whole cell SOC currents in PASMCs. SKF-96365 was added to the perfusate 12 min after CPA. B, individual I-V relationships under resting conditions (a, Control), and in the presence of CPA (b) and SKF-96365 (c). C, mean I-V relationships of whole cell SOC currents. Data are means ± SE, n = 6. * denotes significant difference CPA alone. To determine whether PKG can modulate SOCs, this study first employed whole cell patch clamp electrophysiology to monitor SOC currents in the absence of presence of KT5823. 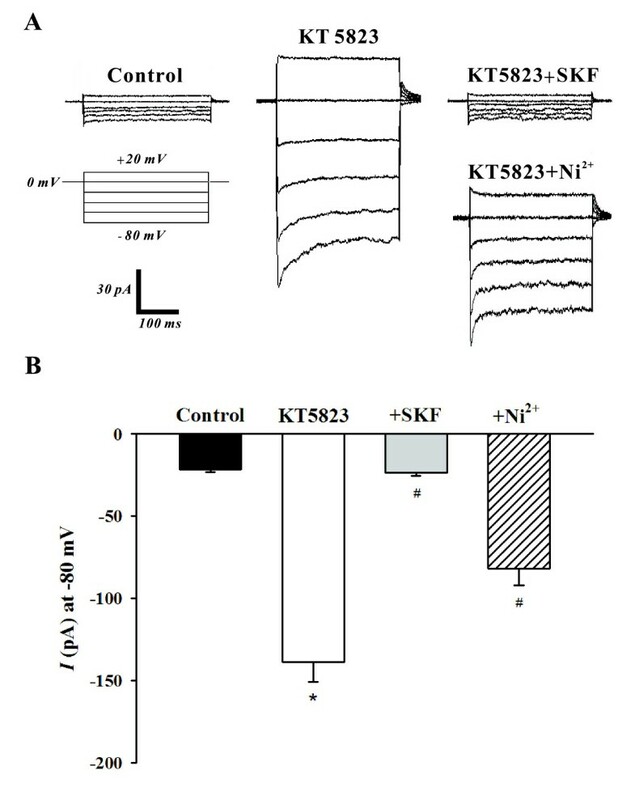 The representative trace in Figure 2A illustrates that the bath application of KT5823 (3 μM) elevated SOC current and that SOC inhibitors SKF-96365 (10 μM) and Ni2+ (0.1 mM) [13, 16] reversed and attenuated this effect respectively. As shown in Figure 2B, the mean inward current (at -80 mV) increased from -21.6 ± 1.4 pA to -138.8 ± 12.0 pA (n = 6, P < 0.01) in the presence of KT5823 and this effect was largely eliminated by SKF-96365 (-23.5 ± 2.1 pA, n = 6, P < 0.01) or Ni2+ (-82.0 ± 10.1 pA, n = 6, P < 0.01). With whole cell measurements suggesting that PKG likely inhibits SOCs in PASMCs, the cell-attached configuration was subsequently employed to assess single channel SOC activity prior to and following PKG inhibition. 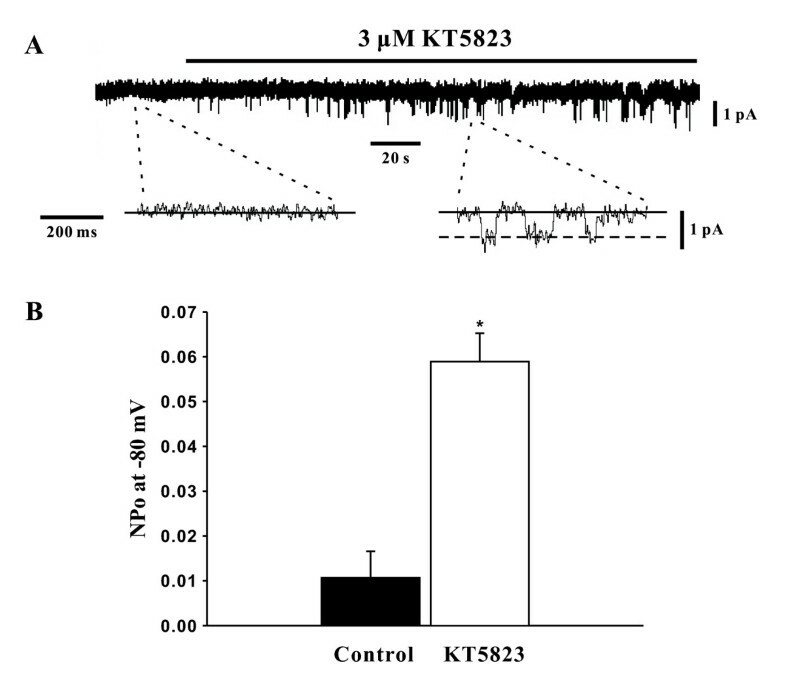 Representative traces in Figure 3A show on two different time scales that the bath application of KT5823 (3 μM) increases SOC activity. Summary data in Figure 3B highlights that KT5823 elevated the mean open probability (NPo) from 0.0107 ± 0.0059 to 0.0589 ± 0.0063 (n = 6, P < 0.01). PKG inhibition by KT5823 augments SOC whole cell currents. Using whole cell patch clamp electrophysiology, PASMCs were voltage clamped and then periodically exposed to a step protocol (-80 mV to +20 mV, 20 mV increments, 300 ms duration) in the absence and presence of 3 μM KT5823 ± 10 μM SKF-96365 (SKF) or 0.1 mM Ni2+. A representative trace and summary data can be found in A &B, respectively. Data are means ± SE, n = 6. * and # denote significant difference from control and KT5832, respectively. PKG inhibition by KT5823 augments single channel SOC activity. Using cell attached patch clamp electrophysiology, single channel SOC activity in PASMCs was assessed (holding potential, -80 mV) in the absence and presence of 3 μM KT5823. Representative traces and summary data can be found in A &B, respectively. Data are means ± SE, n = 6. * denotes significant difference from control. 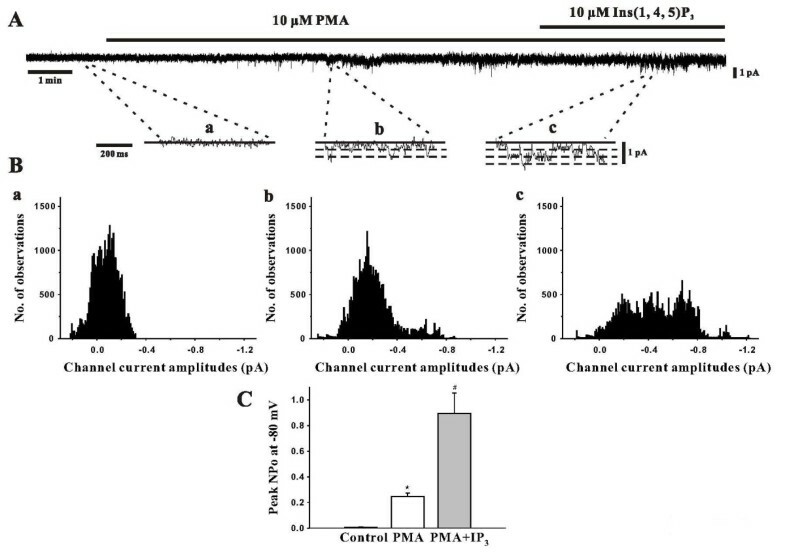 To ascertain the role of PKA in the modulation of SOCs, this study again employed whole cell patch clamp electrophysiology to monitor SOC currents in the absence and presence of H-89. 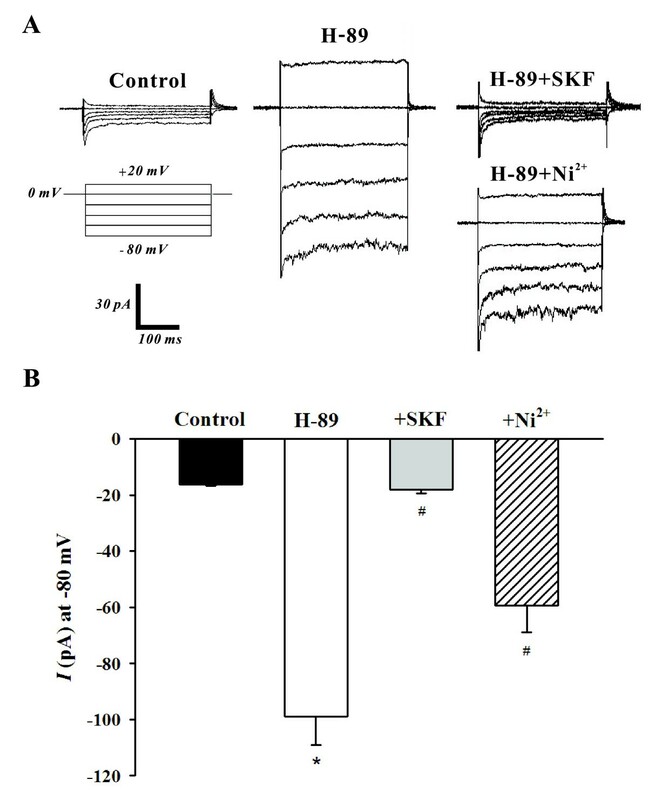 The representative trace in Figure 4A shows that the addition of H-89 (10 μM) significantly increased the SOC current and that the bath application of SKF-96365 (10 μM) and Ni2+ (0.1 mM) abolished and attenuated this elevation respectively. Mean inward current (at -80 mV) plotted in Figure 4B further emphasized that the H-89 induced increase in SOC activity (-16.2 ± 0.5 pA to -98.8 ± 9.1 pA, n = 6, P < 0.01) was indeed effectively blocked by SKF-96365 (-17.5 ± 1.6 pA, n = 6, P < 0.01) or Ni2+ (-59.4 ± 9.5 pA, n = 6, P < 0.01). With whole cell measurements indicating that PKA likely inhibits SOCs in PASMCs, the cell-attached configuration was once again employed to monitor single channel SOC activity. The representative trace in Figure 5A nicely illustrates, at two different time scales, that the bath application of H-89 (10 μM) elevates SOC activity. Mean NPo was plotted in Figure 5B and reinforces that single channel SOC activity rose from 0.0106 ± 0.0056 to 0.0798 ± 0.0028 (n = 6, P < 0.01) in the presence of H-89. PKA inhibition by H-89 augments SOC whole cell currents. Using whole cell patch clamp electrophysiology, PASMCs were voltage clamped and then periodically exposed to a step protocol (-80 mV to +20 mV, 20 mV increments, 300 ms duration) in the absence and presence of 10 μM H-89 ± 10 μM SKF-96365 (SKF) or 0.1 mM Ni2+. A representative trace and summary data can be found in A &B, respectively. Data are means ± SE, n = 6. * and # denote significant difference from control and H-89, respectively. PKA inhibition by H-89 augments single channel SOC activity. 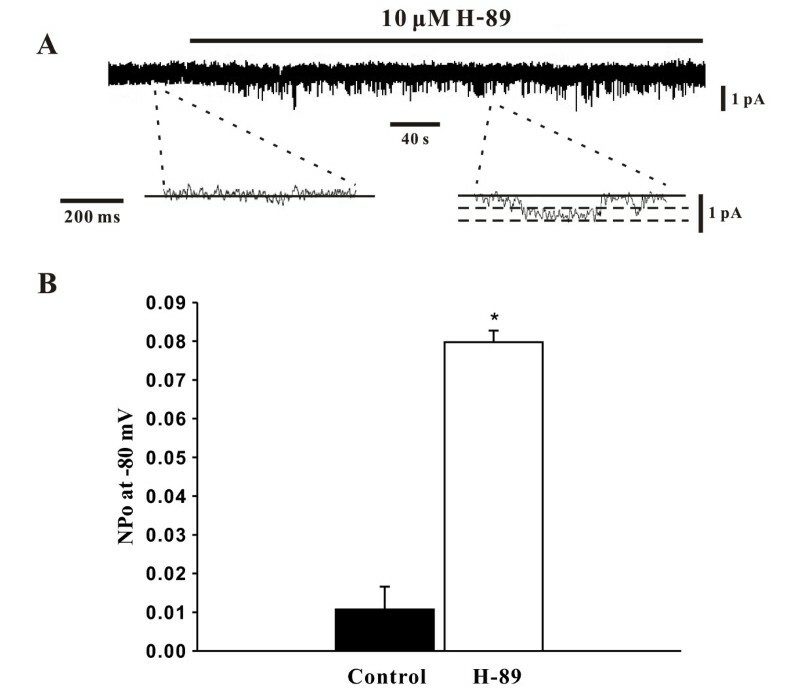 Using cell attached patch clamp electrophysiology, single channel SOC activity in PASMCs was assessed (holding potential, -80 mV) in the absence and presence of 10 μM H-89. Representative traces and summary data can be found in A &B, respectively. Data are means ± SE, n = 6. * denotes significant difference from control. Finally, to study the involvement of PKC and possibly Ins(1,4,5)P3 in SOC modulation, the inside-out configuration was utilized to monitor these channels in the absence and presence of PMA (a PKC activator) and Ins(1,4,5)P3. As the representative traces in Figure 6A show, bath application of PMA (10 μM) induced a modest increase in SOC activity that was further augmented by the addition of Ins(1,4,5)P3. The amplitude and NPo histograms in Figure 6B and 6C statistical confirm this. Of particular note was the increase in NPo from 0.0056 ± 0.0023 to 0.2475 ± 0.0261 (P < 0.05) and to 0.8949 ± 0.1573 (n = 6, P < 0.05) as paired experiments advanced from rest, to PMA addition and finally to the dual application of PMA and Ins(1,4,5)P3. Cumulatively, these experiments support an important role for PKC and IP3 in the activation of SOCs in PASMCs. Effects of PKC activation and Ins(1,4,5)P 3 on single channel SOC activity. Using inside out patch clamp electrophysiology, single channel SOC activity in PASMCs was assessed (holding potential, -80 mV) in the absence and presence of 10 μM PMA ± 10 μM Ins(1,4,5)P3. Representative traces and amplitude histograms of single channel currents (a, control; b, PMA; c, PMA + Ins(1,4,5)P 3 can be found in A &B, respectively. Mean NPo data was plotted in C. Data are means ± SE, n = 6. * and # denote significant difference from control and PMA, respectively. This study is the first to use patch clamp electrophysiology to investigate the role of protein kinases in the modulation of SOCs in rat PASMCs. To briefly summarize, this study observed that PKG and PKA elicited an inhibitory effect on SOC channels when measured at the whole cell and single channel level. Conversely, PKC appears to activate these channels and this augmentation was enhanced by the addition of Ins(1,4,5)P3 (Figure 7). The findings show that SOCs in PASMCs are diversely targeted by protein kinases. Such regulation likely plays an important role in setting pulmonary arterial tone under normal and pathophysiological conditions. Diagram highlighting protein kinase modulation of SOCs in rat PASMCs. Note that protein kinase G (PKG) and protein kinase A (PKA) inhibit SOC currents whereas protein kinase C (PKC) appears to activate SOC currents. PKC activation of SOC currents is augmented by phospholipase C (PLC) activation and the production of Ins(1,4,5)P 3 . AC, adenylate cyclase; sGC, soluble guanylate cyclase. There are three types of SOCs described in vascular smooth muscles. ISOC1 is the conductance (γ = 2-3 pS) described in rabbit portal vein myocytes. ISOC2 is the conductance (γ = 3 pS) described in aortic smooth muscle. ISOC3 is the conductance described in mouse anococcygeus muscle due to its estimated conductance of less than 1 pS . 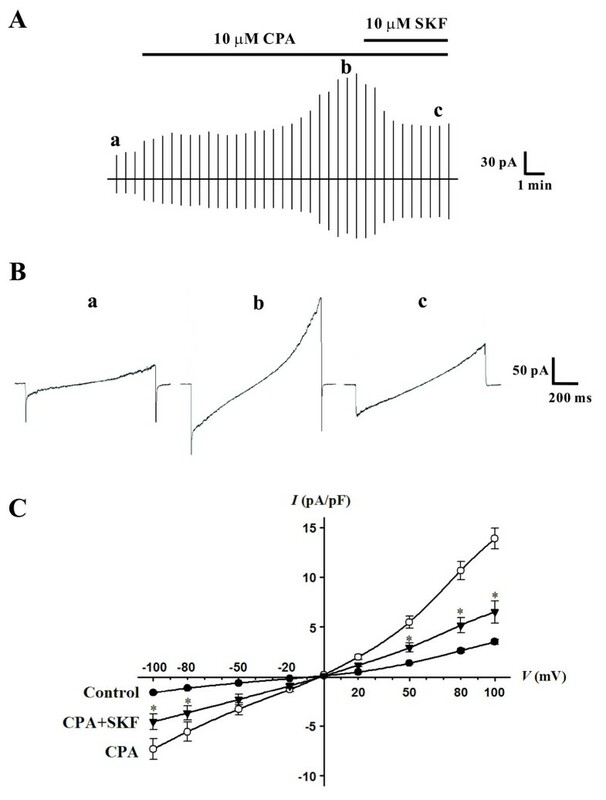 Single channel currents induced by CPA have also been recorded in cell-attached patches from cultured human PASMCs, which had a slope conductance of about 5 pS . From the differences in the biophysical properties of SOCs recorded in smooth muscles, it is evident that there are different types of SOCs which probably reflect different molecular identities and possibly physiological functions . SOCs play an important role in controlling Ca2+ influx, arterial tone development and smooth muscle cell growth in the pulmonary vasculature [6, 7]. While it is commonly agreed that these channels are activated by SR store depletion, their electrical properties do show some degree of variability. For example, the I-V relationship of SOC currents can be both linear in nature or outward rectifying . Their relative permeability for monovalent and divalent cations has also been difficult to precisely define but appears to shift among published studies . In this study, we report that CPA-evoked currents in rat PASMCs display, in essence, a linear I-V relationship at negative potentials and a limited degree of outward rectification at positive potentials. Although relative cation permeability was not directly ascertained, the composition of our recording solutions dictates that at negative potentials, Na+/Ca2+ influx should dominate the whole cell current where as Cs+ efflux will dominate at positive potentials. As such, the SOC channels noted in this investigation share some of the same biophysical characteristics as those previous isolated from rat and human pulmonary arteries [17, 18]. The guanylate cyclase-cyclic GMP-protein kinase G signaling pathway plays a pivotal role in several physiological processes including vascular tone development and cell cycle progression. Broadly speaking, studies have shown that activation of this NO-dependent signaling pathway characteristically attenuates SOC activity in smooth muscle [19–21]. This is exemplified by the inhibition of SOCs not only in A7R5 cells  but in native smooth muscle cells derived from the mouse anococcygeus and the rat systemic circulation [4, 23, 24]. In HEK-293 cells expressing recombinant canonical transient receptor potential isoform 3 (TRPC3), protein kinase G was reported to phosphorylate and inhibit Ca2+ influx through TRPC3 channels, the latter apparently functioning in a store-operated mode [20, 25]. On the other hand, cGMP did not affect the inactivation of Ca2+ release-activated Ca2+ current (ICRAC) in RBL-1 cells , nor did membrane-permeable analogs of cGMP alter store-operated Ca2+ entry (SOCE) in Xenopus oocytes , pancreatic acinar cells , or T lymphocytes . Regulation of SOCE by cGMP is likely therefore to be cell type specific . In a similar manner, it is thought that the adenylate cyclase-cyclic AMP-PKA signaling pathway relaxes vascular smooth muscle in part due to the inhibition of SOCs . Indeed, in portal vein myocytes, β-adrenoceptor stimulation attenuates SOC activity whereas PKA inhibitors (H-89 and KT5720) elicit the reciprocal effect [31, 32]. With regard to PKA-mediated inhibition of SOCs in portal vein myocytes there is some similarity to data obtained in Xenopus oocytes [27, 31]. Petersen and Berridge  demonstrated that low concentrations of dibutyryl cAMP (1-10 μM) inhibited Ca2+ influx but higher concentrations (1-10 mM) potentiated SOCE. It should be noted that in corneal epithelial cells PKA has also been shown to inhibit an epidermal growth factor-evoked Ca2+ influx pathway, attributed to opening of SOCs . In this study, we extended the idea that both the NO-cGMP-protein kinase G and cAMP-protein kinase A signaling pathways effectively regulate SOCs by demonstrating that PKG and PKA inhibition (KT5823 and H-89, respectively) augment single channel activity in PASMCs. From a physiological perspective, this inhibition would likely raise intracellular calcium ([Ca2+]i), an event intimately tied to both contraction and proliferation in PASMCs. Such alterations could in turn contribute to the constriction and medial hypertrophy that commonly underlies pulmonary arterial hypertension (PAH). Past studies have strongly linked PKC activation to the augmentation of SOC activity in vascular smooth muscle . Particularly noteworthy has been the ability of phorbol esters and 1-oleoyl-sn-glycerol (diacylglycerol analogue) to activate and PKC inhibitors to attenuate SOCs [4, 8, 34]. Interestingly, this PKC-induced activation of vascular SOCs appears to be augmented by the production of IP3 and/or the depletion of PIP2[2, 35]. Such observations suggest some degree of cooperation among the various signaling events activated by vasoconstrictors via G-protein coupled receptors. 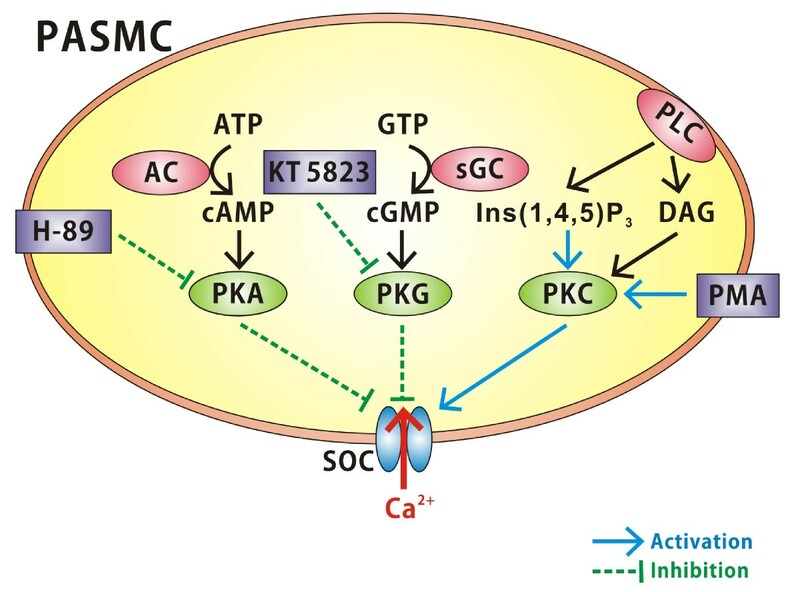 In canine pulmonary vein smooth muscle cells, activation or inhibition of PKC was found to have no effect on SOCE ; thus, there appears to be considerable diversity in the role of PKC plays in regulating this Ca2+ entry pathway in different cells . Perhaps SOCE pathways differ in different blood vessels. Indeed, smooth muscle cells from mesenteric and coronary arteries have store depletion activated cation channels with distinct properties, although both are activated by PKC . A wide range of properties have been reported for SOCs in different smooth muscle preparations, suggesting that multiple cation channels can be opened by store depletion [37, 38]. In this study of PASMCs, we observed a similar phenomenon whereby the PMA-induced increase in SOC activity was further enhanced by the application of IP3. Generally speaking, in physiological states this activation would be more important than PKG and PKA inhibition to induce both the contraction and proliferation in PASMCs, which promotes the development of severe PAH. It is generally agreed that SOCs are relatively difficult to isolate from other conductance channels in the plasma membrane because of a deficiency of highly selective pharmacological agents and the lack of selectively characteristic electrophysiological properties. A previous report  demonstrated that cell-attached recording may be an improved method for studying SOCs in smooth muscle, and benefits from the advantage of not disturbing the intracellular milieu. In this study, we initially showed that PKG and PKA inhibition and PKC activation enhance the SOC currents in freshly dispersed rat PASMCs. Nevertheless, over the time course of typical experiments, we cannot exclude the possibility that an induced current of such amplitude is due to a change in 'leak' which might occur, for example, due to myocyte contraction. Accordingly, to further confirm our findings, cell-attached and inside-out configurations were used to measure single channel SOC activity with and without PKG and PKA inhibitors (KT5823 and H-89) and PKC activator (PMA) and IP3. The data obtained from single channel SOC activity was consistent with those of whole cell SOC currents. However, we still need to interpret our findings cautiously because the supposed opposite effects on SOC channels with activators of PKG and PKA and/or inhibitors of PKC in rat PASMCs remain unresolved. Also, it is not yet clear what upstream and/or downstream signaling molecules are involved in these protein kinase pathways. In summary, this study presents evidence that protein kinases play an important role in regulating SOCs in smooth muscles derived from the pulmonary artery. While McElroy et al. previously used Ca2+-imaging technique to show that protein kinases can regulate SOCs in rat PASMCs, this investigation appears to be the first to use patch-clamp electrophysiology to measure similar SOC regulation at the whole cell and single channel level. Given that enhanced SOC activity has been linked to the development of pulmonary arteriopathies, we proposed that protein kinase modulation may provide a means of attenuating the progression of these debilitating disorders. The authors would like to thank Suzanne E. Brett Welsh for her help reading and discussing this manuscript. This study was supported by a grant NSC97-2320-B-037-006-MY3 to Dr Bin-Nan Wu from the National Science Council, Taiwan. Dr Donald Welsh is supported by the Natural Science and Engineering Research Council of Canada. ISC performed the experiments and drafted the manuscript. ZKD and IJC provided the ideas and participated in the design and coordination of this study, and helped to draft the manuscript. DGW and BNW designed and directed the experiments, interpreted the data and polished the paper to meet the scientific content. All authors read and approved the final manuscript.